A.M. Bakalar is the author of Madame Mephisto, published by Stork Press in 2012. Madame Mephisto was among readers’ nominations to the 2012 Guardian First Book Award. She is the first Polish woman to publish a novel in English since Poland joined EU in 2004. 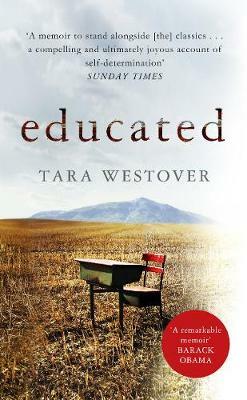 Her writing has appeared in The Guardian and The International New York Times. She was the editor of Litro Magazine Polish Issue and recently her essay ‘The Future of Paper Books’ has been published in Wasafiri Birthday Edition. Asia was born and raised in Wroclaw, Poland. She lived in Germany, France, Sicily and Canada before she moved to the UK in 2003. She lives in London, with her partner, a drum and bass musician. Everything I read I keep on my bookshelves or any other space I can find for them. But a few months ago I was told there were cracks in the walls which hold some of my shelves, and the living room was becoming a danger zone, in case the books start falling down. Which, frankly, has happened a few times when I tried to place one more book on top of the other so with a heavy heart I began to stack the books I can live without on the floor until I give them away. Now, I try to keep only the books I really really love, and if I read something I’m not super excited about, I add it to the pile of give aways. This is incredibly hard for me because if I could I would make my house one big library but my partner is not too thrilled by the idea. He has a big collection of drum and base vinyl records but his takes less space. There’s a lot of negotiation going on when new books arrive as I try to find place for them. I keep books in my home in London and I also have boxes of hundreds of books in Wroclaw, Poland, my mum is taking care of them. One day I’d like to ship them to London, when we have a bigger house. I used to have a flat back in Poland and I had to pack all the books in boxes and store in the basement. One day my mum called me there was fire in the basement. I almost had a heart attack thinking all my books are gone. Then my mum said: ‘Guess what, everything burnt except the books.’ Call that luck or some intervention of a Book God, if one exists. I have to organise otherwise I wouldn’t be able to find anything but it still takes me a while to find what I want. In the kitchen I only keep books by African authors and theory of literature; postcolonialism, comparative literature and world feminism. I was doing PhD in Nigerian and Zimbabwean women’s fiction before I decided to write fiction. A lot of books in that section reflect that period, and any new fiction out of Africa goes there. This is a place where I write as well so there’s a big section of research books depending what I’m working on. And, there’re a few shelves with books that are waiting to be read. I pile them in the kitchen until they are read and moved around. And some cook books as well. In the bedroom I only keep science fiction and books by my bedside. 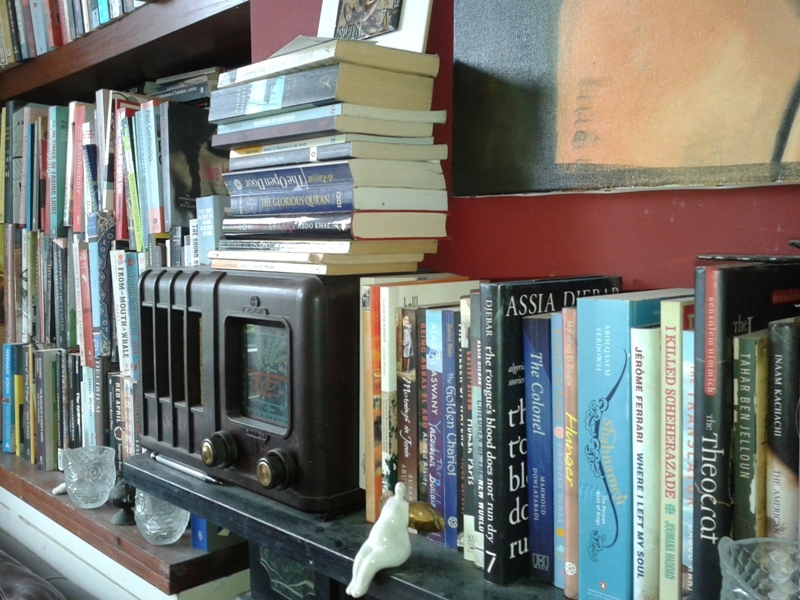 The living room is devoted to fiction in translation, British fiction, books from Poland, non-fiction, poetry and drama, graphic novels and books by Middle Eastern authors. In the bathroom I keep a few titles as well, for a quick read when taking a bath. Once I finish reading something I pile it onto a small table until there’s no space and then I distribute them to various sections around the flat and I stack them alphabetically. A few years ago I had a personal book stamp and used to add a date and place where I got a book but there’re so many of them I can’t be bothered anymore. I have a Kindle but can’t stand reading eBooks which my partner finds incredibly disappointing because he thinks one day we will both be buried under the books and it will be all my fault. Honestly, I don’t remember the first book I bought. I remember the first money I ever made was weeding out the garden of my grandmother’s neighbour and I spent it on books but I have no idea what I bought then. I have some books which disappointed me but I still keep them, until I give them away of course. One man’s thrash is another man’s treasure. Reading is so much fun I don’t really care whether people feel embarrassed when they look at my books. One of my friends told me she only reads very violent crime fiction and her mother suggested perhaps she should not invite men for tea to see her book collection as they will be scared of her. But she loves her books so they are stay where they are. I had people feel uneasy about some of the books I have, e.g. Dying for the Truth. Undercover inside the Mexican Drug War by the Fugitive Reporters of Blog Del Narco, but there’s a yellow tape around it with a warning so they think twice before opening it. 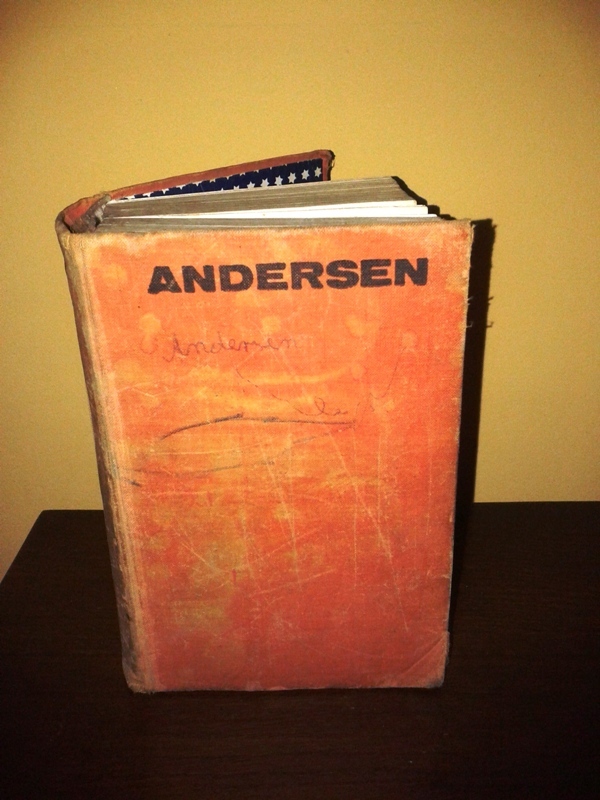 There’s a book my mum read to me when I was a child, a collection of all Hans Christian Andersen’s stories published in 1969 in Poland. It has my drawings in it when I was small and some over thirty year old dried flowers between pages. For a long time my mum refused to give to me but I managed to convince her. Apart from emotional value it is simply a beautiful book, bound in orange cloth with incredibly delicate pages, and front and back pages of dark indigo sky with stars. Both of my parents love reading and my dad has a wonderful collection of science fiction books, while my mum reads everything else. I was always encouraged to read pretty much everything. But there was a book they kept hidden behind their collection: John Cleland’s Fanny Hill, Memoirs of a Woman of Pleasure. It was a true undercover operation I had to resort to in order to lay my hands on this book. I would wait until they were both gone to work or ran some errands. I would sneak into the room to read a few pages at a time until I heard a key turn in the lock and frantically place the book the way it was on the shelf so they wouldn’t notice. I would always pretend I was just looking at something to read, with my cheeks burning and praying they would leave again so I could finish it! I think I read this book a few times like that, even memorised some fragments, but sadly I don’t remember any of it now. I try not to borrow books from friends as I never give them back. I usually write down the title and the author and buy it. Every year I buy a small notebook where I write down titles of books I want to read. Once I buy it I cross it down so I know I got it. I still go back to some of the notebooks from few years back and slowly go through them. I read over 100 books a year and buy around 150. And my parents buy me books as well, especially books translated into Polish which are not available in English, and some Polish books as well. I’m beginning to think I have OCD when it comes to buying books. 1988 edition of Ernesto Sábato’s On Heroes and Tombs, which is waiting to be read. A massive over 800 pages long Mrs M. Grieve’s A Modern Herbal I love reading on herbs and plants and their history. Davi Kopenawa’s The Falling Sky on Yanomami culture and cosmology. I’m finishing Elif Shafak’s The Architect’s Apprentice which I really enjoy reading. And there’re some science fiction books as well: Alfred Bester’s The Stars My Destination, Peter Watt’s Echopraxia and Roger Zelazny’s Lord of Light. I also got really cool collection of drawings by a Lebanese author Mazen Kerbaj, Beyrouth. Julliet-Août 2006, in French, English and Arabic. During the Israeli attack in 2006 Kerbaj posted a kind of cartoon diary on his blog and it was published in a book form. Complete translation in ten volumes of The Mahabharata. I have the first three volumes translated by J. A. B. van Buitenen, the great Indologist who began the translation at the University of Chicago. When I studied English Literature back in Poland we had an amazing Sanskrit scholar, professor Joanna Sachse, and once every week we had lectures on Indian literature. For an hour professor Sachse was telling us the story of The Mahabharata. I was mesmerised. It really made the huge impact on how I perceive books. (Talking about the power of storytelling!) And since then I’ve always wanted the read the whole thing. The problem with The Mahabharata is that it’s the longest epic poem ever written, almost two million words! So it’s physically impossible for one translator to finish the work because a lifetime is not enough. I’ve been buying each volume every few years. I hope I can still read the ten volumes before I die. I was told I’m slightly mad because of the amounts of books in my place and I guess I am. I’m just totally obsessed with reading but I love it anyway. A huge thanks to Asia for taking part in Other People’s Bookshelves, you can find out more about her at her website here! 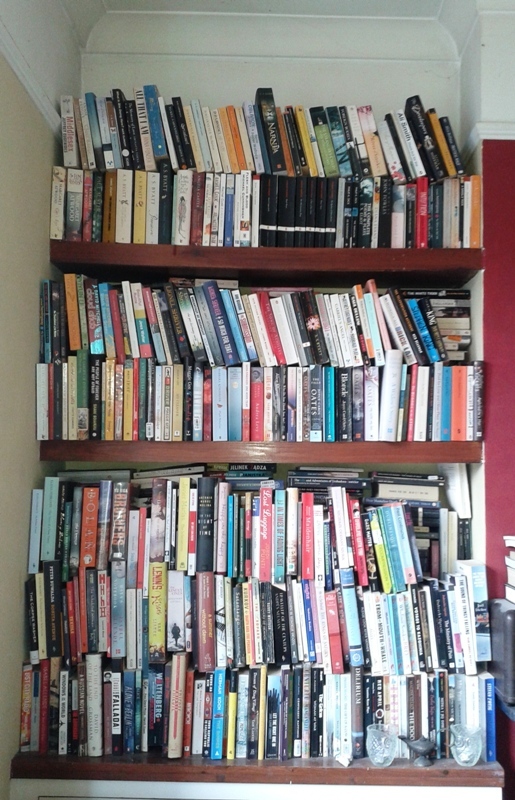 If you would like to catch up with the other posts in the series of Other People’s Bookshelves have a gander here. Don’t forget if you would like to participate (and I would love you to – hint, hint, hint as without you volunteering it doesn’t happen) in the series then drop me an email to savidgereads@gmail.com with the subject Other People’s Bookshelves, thanks in advance. In the meantime… what do you think of A’s responses and/or any of the books and authors that she mentions? 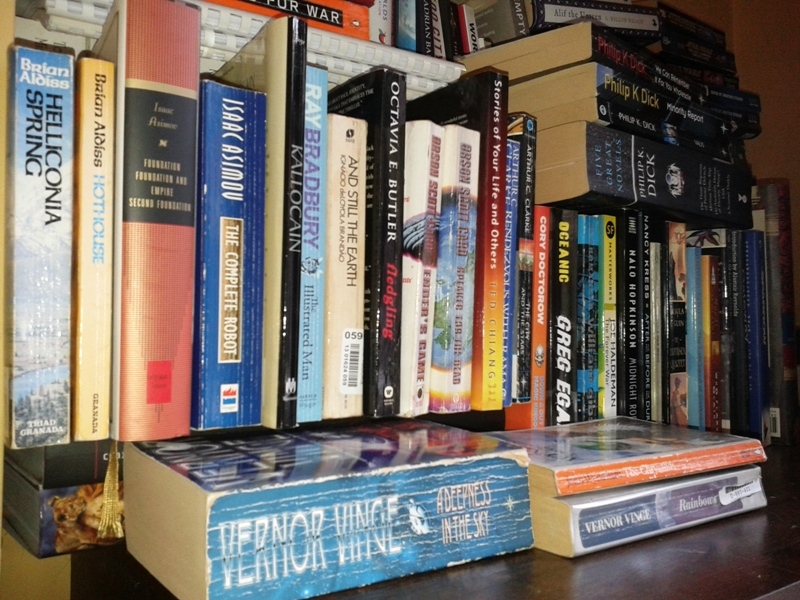 Ah, someone else with a real book buying and keeping problem… and also someone whose shelves do not look suspiciously tidy (I do think, Simon, that sometimes people tidy up especially before sending you their pictures, don’t you?). I’ve read and really enjoyed Asia’s debut novel and look forward to reading more from her. I too have some books in attics and basements in other countries and dream – some day- of being reunited with all of them. 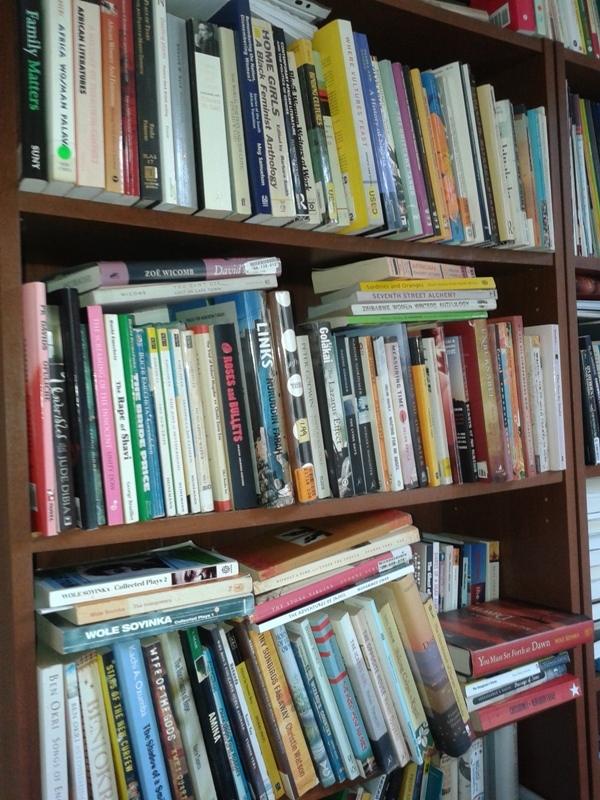 Asia’s bookshelves look like my bakers rack in my bedroom – piled to the hilt. Then I take baskets and put books in the baskets all over my bedroom to help me with the overflow. Loved this interview. I really enjoyed seeing the copy of Hans Christian Andersen’s stories and reading about its personal significance for your guest booklover. I was also delighted at her mention of the Mahabharata! I have the amazing van Buitenen translation volumes she mentioned, along with a boxed 4-vol set translated by K. M. Ganguli. It is hard to forego collecting such treasures, when they open up such a rich story! Thanks for another fascinating interview. I love how stacked her shelves are!! I want my apartment to eventually look like this. I just love a shelf that’s stuffed with books. I love snooping around other people bookshelves. It feels so seedy but yet so right! I’m going to visit her site now and I’m going to email you about being part of this series! Yay!! Peter Watts. He is an amazing writer and very underrated.